Thanks to Crystal for telling us about what will definitely be a pimp show! Jurassic 5 yo! Comin' to Stubb's... August 1st... it's so fresh... tix aren't even on sale till this Saturday, June 10th @ 10AM... check their site for tix! 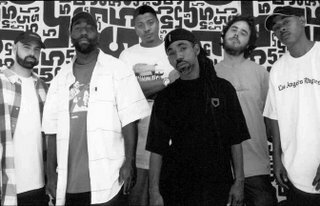 Jurassic 5 is a five-piece hip hop crew that was formed in 1993 at the Los Angeles, California, venue Good Life. Rappers Chali 2na, Akil, Zaakir aka Soup, Mark 7even, and turntable maestros DJ Nu-Mark and DJ Cut Chemist came together from two separate crews, the Rebels of Rhythm and Unity Committee. Cut Chemist has since left the group.